We put the ‘roof’ in waterproof. Because garden roof design is virtually limitless, each project will be unique and designed to meet specific objectives. The WetSuit® membrane can be installed to any mil thickness in one coat, either horizontally or vertically, allowing freedom of design for the roof deck. Neptune Coating’s experienced staff and GRP’s work closely with your team, from early design, to detail and specification development, to make sure these specific objectives are met. 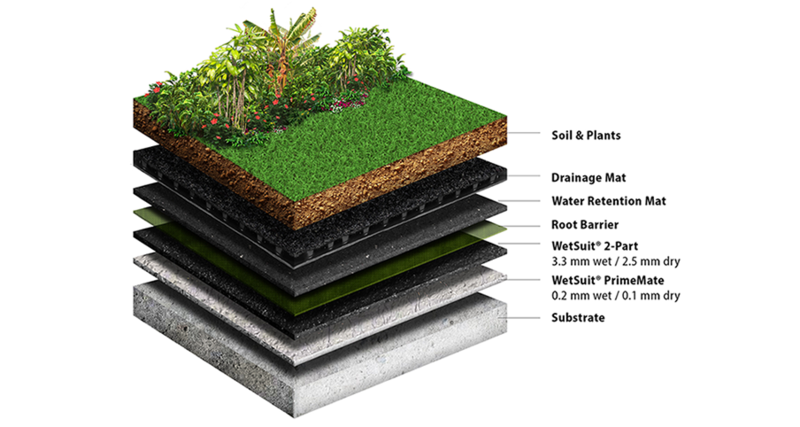 WetSuit® is an ideal system for green roof retrofits, where existing roofs can simply be cleaned and rapidly sealed with the WetSuit® membrane. Often, existing roofs are on the verge of being too old to place a garden roof over. The lightweight WetSuit® membrane can build upon the base of the existing roof, creating a multi layer, monolithic system, without the need of costly tear offs, while delivering up to 20 year warranties.